THE sign 'do not feed the animals' is most often found at a zoo or is positively encouraged at the 'Farmer Giles' tourist attraction a few miles from Warminster for their farm animals. Walking back to his car in Chinns Yard Paul Macdonald was about to take pity on a feline inhabitant that was demanding attention when he spotted a rather unusual warning. On a tree providing shade for motorists parking before heading off to the town centre is an A4 sized request not to feed a cat called Tinker. 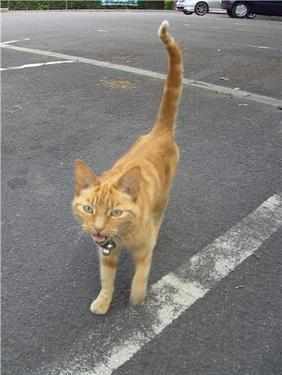 "I use the Chinn's Court car park a lot and this cat came up to say hello several times recently," said Paul. "I just assumed that it was the same as when my dog Ginny was alive that other hounds would wander over. At home we have two cats called Angel and Buffy!" "I felt a huge sympathy for an obviously well loved pet," added Paul. "We love pampering and spoiling pets but on this occasion no titbits is the request."